Matisse’s cover, VERVE The French Review of Art Volume 2, Number 8 (Sept-Nov 1940). Printed in France. Milwaukee Art Museum, Gift of Lillian Schultz. Photo by Beret Balestrieri Kohn. Imagine having your favorite artists, authors, philosophers and others ready at your beck and call for any project you desire. Published by E. Tériade, “Verve: The French Review of Art” was a legendary quarterly art journal with that kind of seemingly-limitless access to legendary artists. From 1937 to 1975, Tériade (real name Stratis Eleftheriades, French 1889–1983) was an art critic, patron, and publisher that commissioned artists and philosophers, including Pablo Picasso, Henri Matisse, and André Derain to produce works for his prestigious journal. This particular issue of “Verve” (Vol. 2, No. 8, Sept—Nov 1940), devoted to the “Nature of France”, features a luxurious dark dust jacket after Matisse’s paper cutouts. 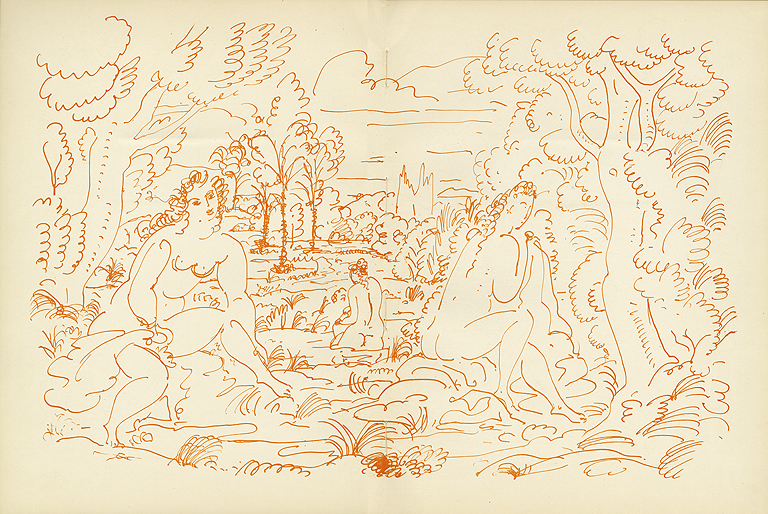 Henri Matisse (1869-1954), already renowned for his paintings and drawings, turned to working with cutouts (or gouaches découpés) following surgery for cancer around the time of this journal. Matisse, a descendant of French weavers, used the scissors and pins of his ancestral trade to ‘paint with scissors’ which in turn produced some of the most admired and influential graphic works of Matisse’s entire career. Working closely with Tériade, Matisse spent the war years creating colorful paper cut collages that Tériade would publish later in the limited-edition book “Jazz” in 1947. The Milwaukee Art Museum Library has the 1983 Braziller edition of Matisse’s celebrated publication. 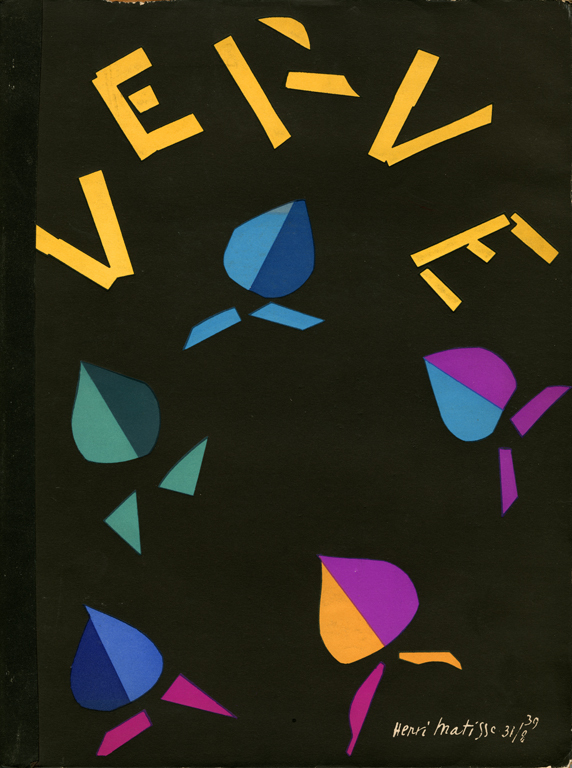 In addition to the dust jacket by Matisse, this 78-page issue of “Verve” features a variety of text and images both historical and contemporary. At its center is a double-page original color lithograph (pictured above) by Pierre Bonnard entitled “Sunset over the Mediterranean”. Also featured are heliogravure illuminations of the fifteenth century Calendar of Charles D’Angouleme in color and in gold, juxtaposed with colored drawings of the annual calendar by André Derain. In addition to Matisse and Bonnard, this issue includes texts by George Rouault (“Visage de la France”), Georges Braque (“Reflexions”) and André Malraux (“Outlines of a Psychology of the Cinema”) alongside reproductions of black & white and color drawings and paintings by Pablo Picasso, Nicolas Poussin, and Jean-Baptiste-Siméon Chardin among others. Printed just days before the German invasion of Paris during WWII, the journal’s colophon recounts that “[T]his the Eighth Number of Verve, devoted to the Nature of France, was entirely composed during the war, its printing was completed in Paris, June 1, 1940” and, according to the publisher, more than half of the edition was lost. Despite the loss of half of the issue, three different printers were required to complete the effort, one for typography and color process work, one for heliogravure in color and in gold, and another for lithography. A beautiful and time consuming endeavor I imagine, well worth the $2.50 for which it originally sold. And so beautiful the craftsmanship that I imagine it to be as visually arresting today as it was on the newsstand 71 years ago. This entry was posted in Art, Library/Archives and tagged European art, French Art, Henry Matisse, Library/Archives, Modern art, Pablo Picasso, Pierre Bonnard, Verve. Bookmark the permalink. I have this and another issue of verve-oct-dec no.3 cover by bonnard. I also have vior, 1948, paul eluard, and Piccaso et les chemins de la connaissance-was wondering about historic museum value-the cover by matisse is torn but all illustrations on all of those identified above are good. some in french.